Apart from independent OSS projects, an increasing number of companies, including the blue chips, are opening their source code to the public. They start by distributing their internally developed products for free, giving rise to widespread frameworks and libraries that later become an industry standard (e.g., React, Flow, Angular, Kubernetes, TensorFlow, V8, to name a few). Adding to this momentum, there has been a surge in venture capital dollars being invested into the sector in recent years. Several high profile funding rounds have been completed, with multimillion dollar valuations emerging (Chart 1). But are these valuations justified? And more importantly, can the business perform, both growth-wise and profitability-wise, as venture capitalists expect? OSS companies typically monetize with a business model based around providing support and consulting services. How well does this model translate to the traditional VC growth model? Is the OSS space in a VC-driven bubble? In this article, I assess the questions above, and find that the traditional monetization model for OSS companies based on providing support and consulting services doesn’t seem to lend itself well to the venture capital growth model, and that OSS companies likely need to switch their pricing and business models in order to justify their valuations. While providing free software is obviously good for consumers, it still costs money to develop. Very few companies are able to live on donations and sponsorships. And with fierce competition from proprietary software vendors, growing R&D costs, and ever-increasing marketing requirements, providing a “free” product necessitates a sustainable path to market success. As a result of the above, a commonly seen structure related to OSS projects is the following: A “parent” commercial company that is the key contributor to the OSS project provides support to users, maintains the product, and defines the product strategy. Historically, the vast majority of OSS projects have pursued the first monetization strategy (support and consulting), but at their core, all of these models allow a company to earn money on their “bread and butter” and feed the development team as needed. An interesting recent development has been the huge inflows of VC/PE money into the industry. Going back to 2004, only nine firms producing OSS had raised venture funding, but by 2015, that number had exploded to 110, raising over $7 billion from venture capital funds (chart 2). Underpinning this development is the large addressable market that OSS companies benefit from. Akin to other “platform” plays, OSS allows companies (in theory) to rapidly expand their customer base, with the idea that at some point in the future they can leverage this growth by beginning to tack-on appropriate monetization models in order to start translating their customer base into revenue, and profits. At the same time, we’re also seeing an increasing number of reports about potential IPOs in the sector. Several OSS commercial companies, some of them unicorns with $1B+ valuations, have been rumored to be mulling a public markets debut (MongoDB, Cloudera, MapR, Alfresco, Automattic, Canonical, etc.). With this in mind, the obvious question is whether the OSS model works from a financial standpoint, particularly for VC and PE investors. After all, the venture funding model necessitates rapid growth in order to comply with their 7-10 year fund life cycle. And with a product that is at its core free, it remains to be seen whether OSS companies can pin down the correct monetization model to justify the number of dollars invested into the space. Answering this question is hard, mainly because most of these companies are private and therefore do not disclose their financial performance. Usually, the only sources of information that can be relied upon are the estimates of industry experts and management interviews where unaudited key performance metrics are sometimes disclosed. Nevertheless, in this article, I take a look at the evidence from the only two public OSS companies in the market, Red Hat and Hortonworks, and use their publicly available information to try and assess the more general question of whether the OSS model makes sense for VC investors. Red Hat is an example of a commercial company that pioneered the open source business model. Founded in 1993 and going public in 1999 right before the Dot Com Bubble, they achieved the 8th biggest first-day gain in share price in the history of Wall Street at that time. At the time of their IPO, Red Hat was not a profitable company, but since then has managed to post solid financial results, as detailed in Table 1. Instead of chasing multifold annual growth, Red Hat has followed the “boring” path of gradually building a sustainable business. Over the last ten years, the company increased its revenues tenfold from $200 million to $2 billion with no significant change in operating and net income margins. G&A and marketing expenses never exceeded 50% of revenue (Chart 3). The above indicates therefore that OSS companies do have a chance to build sustainable and profitable business models. 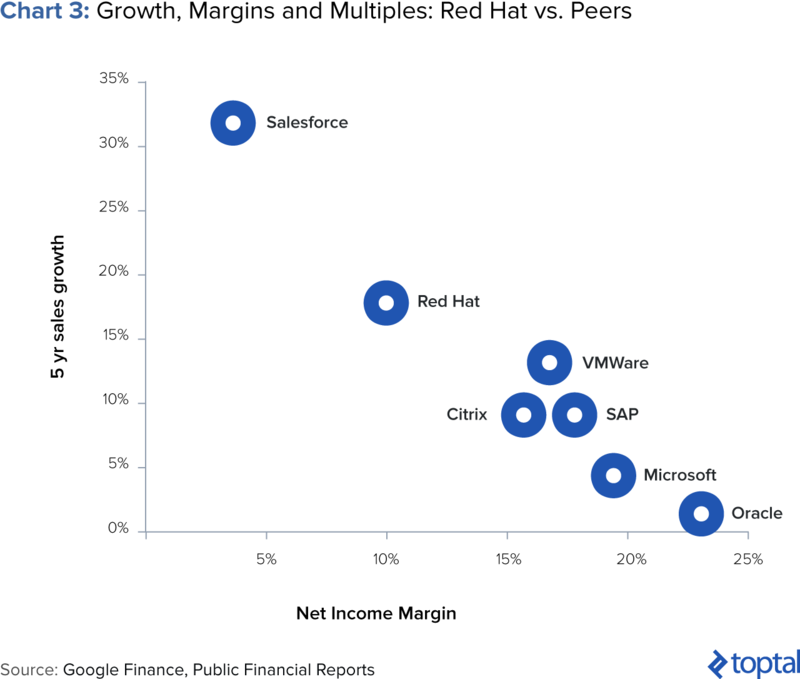 Red Hat’s approach of focusing primarily on offering support and consulting services has delivered gradual but steady growth, and the company is hardly facing any funding or solvency problems, posting decent profitability metrics when compared to peers. However, what is clear from the Red Hat case study is that such a strategy can take time—many years, in fact. While this is a perfectly reasonable situation for most companies, the issue is that it doesn’t sit well with venture capital funds who, by the very nature of their business model, require far more rapid growth profiles. In other words, the open source approach limits the market size from the get-go by making the company focus only on enterprise customers who are able to pay for support, and foregoing revenue from a long tail of SME and retail clients. That may help explain the company’s less than exciting stock price performance post-IPO (Chart 4). If such a conclusion were true, this would spell trouble for those OSS companies that have raised significant amounts of VC dollars along with the funds that have invested in them. To further assess our overarching question of OSS’s viability as a venture capital investment, I took a look at another public OSS company: Hortonworks. The Hadoop vendors’ market is an interesting one because it is completely built around the “open core” idea (another comparable market being the NoSQL databases space with MongoDB, Datastax, and Couchbase OSS). All three of the largest Hadoop vendors—Cloudera, Hortonworks, and MapR—are based on essentially the same OSS stack (with some specific differences) but interestingly have different monetization models. In particular, Hortonworks—the only public company among them—is the only player that provides all of its software for free and charges only for support, consulting, and training services. At first glance, Hortonworks’ post-IPO path appears to differ considerably from Red Hat’s in that it seems to be a story of a rapid growth and success. The company was founded in 2011, tripled its revenue every year for three consecutive years, and went public in 2014. Immediate reception in the public markets was strong, with the stock popping 65% in the first few days of trading. Nevertheless, the company’s story since IPO has turned decisively sour. In January 2016, the company was forced to access the public markets again for a secondary public offering, a move that prompted a 60% share price fall within a month (Chart 5). Underpinning all this is that fact that despite top-line growth, the company continues to incur substantial, and growing, operating losses. It’s evident from the financial statements that its operating performance has worsened over time, mainly because of operating expenses growing faster than revenue leading to increasing losses as a percent of revenue (Table 2). Among all of the periods in question, Hortonworks spent more on sales and marketing than it earns in revenue. Adding to that, the company incurred significant R&D and G&A as well (Table 2). On average, Hortonworks is burning around $100 million cash per year (less than its operating loss because of stock-based compensation expenses and changes in deferred revenue booked on the Balance Sheet). This amount is very significant when compared to its $630 million market capitalization and circa $350 million raised from investors so far. Of course, the company can still raise debt (which it did, in November 2016, to the tune of a $30 million loan from SVB), but there’s a natural limit to how often it can tap the debt markets. All of this might of course be justified if the marketing expense served an important purpose. One such purpose could be the company’s need to diversify its customer base. In fact, when Hortonworks first launched, the company was heavily reliant on a few major clients (Yahoo and Microsoft, the latter accounting for 37% of revenues in 2013). This has now changed, and by 2016, the company reported 1000 customers. But again, even if this were to have been the reason, one cannot ignore the costs required to achieve this. After all, marketing expenses increased eightfold between 2013 and 2015. And how valuable are the clients that Hortonworks has acquired? Unfortunately, the company reports little information on the makeup of its client base, so it’s hard to assess other important metrics such as client “stickyness”. But in a competitive OSS market where “rival developers could build the same tools—and make them free—essentially stripping the value from the proprietary software,” strong doubts loom. 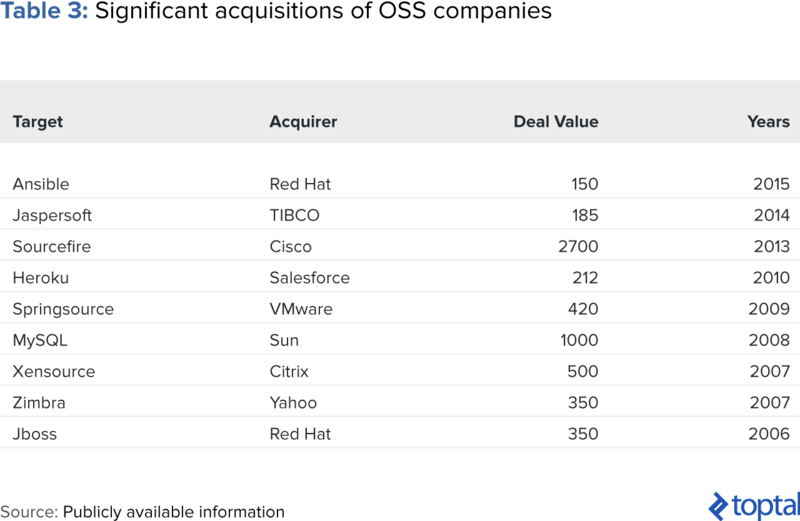 With all this in mind, returning to our original question of whether the OSS model makes for good VC investments, while the Hortonworks growth story certainly seems to counter Red Hat’s—and therefore sustain the idea that such investments can work from a VC standpoint—I remain skeptical. 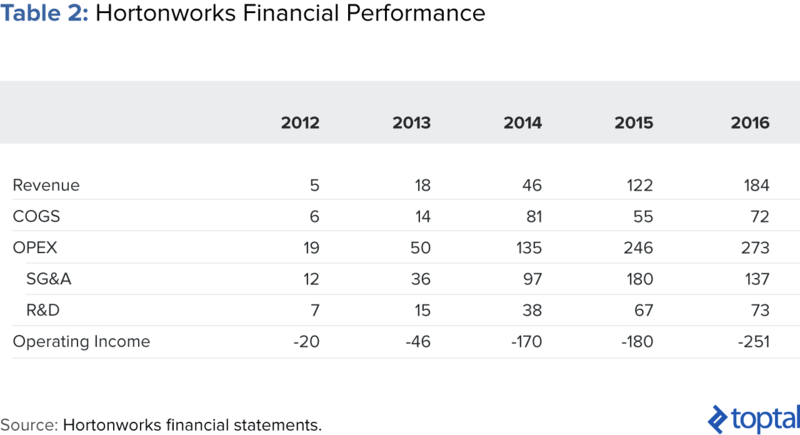 Hortonworks seems to be chasing market share at exorbitant and unsustainable costs. And while this conclusion is based on only two companies in the space, it is enough to raise serious doubts about the overall model’s fit for VC. Why are VCs Investing in OSS Companies? Given the above, it seems questionable that OSS companies make for good VC investments. So with this in mind, why do venture capital funds continue to invest in such companies? Apart from going public and growing organically, an OSS company may find a strategic buyer to provide a good exit opportunity for its early stage investors. And in fact, the sector has seen several high profile acquisitions over the years (Table 3). Getting access to the client base. Sun is reported to have been motivated by this when it acquired MySQL. They wanted to access the SME market and cross-sell other products to smaller clients. Simply forking the product or developing a competing technology internally wouldn’t deliver the customer base and would have made Sun incur additional customer acquisition costs. Acquiring the team. This is more relevant for smaller and younger projects than for larger, more well-established ones, but is worth mentioning. With this in mind, would a strategy of investing in OSS companies with the eventual aim of a strategic sale make sense? After all, there seems to be a decent track-record to go off of. My assessment is that this strategy on its own is not enough. Pursuing such an approach from the start is risky—there are not enough exits in the history of OSS to justify the risks. While the promise of a lucrative strategic sale may be enough to motivate VC funds to put money to work in the space, as discussed above, it remains a risky path. As such, it feels like the rationale for such investments must be reliant on other factors as well. One such factor could be returning to basics: building profitable companies. But as we have seen in the case studies above, this strategy doesn’t seem to be working out so well, certainly not within the timeframes required for VC investors. Nevertheless, it is important to point out that both Red Hat and Hortonworks primarily focus on monetizing through offering support and consulting services. As such, it would be wrong to dismiss OSS monetization prospects altogether. More likely, monetization models focused on support and consulting are inappropriate, but others may work better. Why is SaaS a better model for OSS? There are several reasons for this, most of which are applicable not only to OSS SaaS, but to SaaS in general. First, SaaS opens the market for the long tail of SME clients. Smaller companies usually don’t need enterprise support and on-premises installation, but may already have sophisticated needs from a technology standpoint. As a result, it’s easier for them to purchase a SaaS product and pay a relatively low price for using it. Second, SaaS scales well. SaaS creates economies of scale for clients by allowing them to save money on infrastructure and operations through aggregation of resources and a combination and centralization of customer requirements, which improves manageability. This, therefore, makes it an attractive model for clients who, as a result, will be more willing to lock themselves into monthly payment plans in order to reap the benefits of the service. Finally, SaaS businesses are more difficult to replicate. In the traditional OSS model, everyone has access to the source code, so the support and consulting business model hardly has protection for the incumbent from new market entrants. In the SaaS OSS case, the investment required for building the infrastructure upon which clients rely is fairly onerous. This, therefore, builds bigger barriers to entry, and makes it more difficult for competitors who lack the same amount of funding to replicate the offering. Importantly, OSS SaaS companies can be financially viable on their own. GitHub is a good example of this. Founded in 2008, GitHub was able to bootstrap the business for four years without any external funding. The company has reportedly always been cash-flow positive (except for 2015) and generated estimated revenues of $100 million in 2016. In 2012, they accepted $100 million in funding from Andreessen Horowitz and later in 2015, $250 million from Sequoia with an implied $2 billion valuation. Another well-known successful OSS company is DataBricks, which provides commercial support for Apache Spark, but—more importantly—allows its customers to run Spark in the cloud. The company has raised $100 million from Andreessen Horowitz, Data Collective, and NEA. Unfortunately, we don’t have a lot of insight into their profitability, but they are reported to be performing strongly and had more than 500 companies using the technology as of 2015 already. Generally, many OSS companies are in one way or another gradually drifting towards the SaaS model or other types of cloud offerings. For instance, Red Hat is moving to PaaS over support and consulting, as evidenced by OpenShift and the acquisition of AnsibleWorks. Different ways of mixing support and consulting with SaaS are common too. We, unfortunately, don’t have detailed statistics on Elastic’s on-premises vs. cloud installation product offering, but we can see from the presentation of its closest competitor Splunk that their SaaS offering is gaining scale: Its share in revenue is expected to triple by 2020 (chart 6). Investable Business Model or Not? To conclude, while recent years have seen an influx of venture capital dollars poured into OSS companies, there are strong doubts that such investments make sense if the monetization models being used remain focused on the traditional support and consulting model. Such a model can work (as seen in the Red Hat case study) but cannot scale at the pace required by VC investors. Of course, VC funds may always hope for a lucrative strategic exit, and there have been several examples of such transactions. But relying on this alone is not enough. OSS companies need to innovate around monetization strategies in order to build profitable and fast-growing companies. The most plausible answer to this conundrum may come from switching to SaaS as a business model. SaaS allows one to tap into a longer-tail of SME clients and improve margins through better product offerings. Quoting Peter Levine again, “Cloud and SaaS adoption is accelerating at an order of magnitude faster than on-premise deployments, and open source has been the enabler of this transformation. Beyond SaaS, I would expect there to be future models for open source monetization, which is great for the industry”.